The World's First Virtual Caregiver - Addison, of Addison Care, guides a client through medication management. LAS CRUCES, N.M., Jan. 24, 2019 /PRNewswire/ -- A new technology received its validation at the 2019 Consumer Electronics Show in January in Las Vegas. Addison Care debuted as the world's first, true, virtual caregiving system and the attention from the press, health industry and technology companies is impressive. SameDay Security, Inc., known by its brands Electronic Caregiver and Addison Care, has invested nearly a decade in clinical research, patient screenings, ambient augmented reality, edge computing, machine learning, and 3D virtual care user interfaces to create a remarkable solution. The cost of caregiving has been overwhelming for patients with chronic illnesses, the aging and associated families and caregivers. According to financial demographics, as little as 3 percent of the U.S. population has the funds available to afford even part-time live care support. Most of the population has sought more affordable alternatives or supplements and have come up empty. With the advance of new technologies bundled with complementary, affordable, in-person care services, all this is about to change. 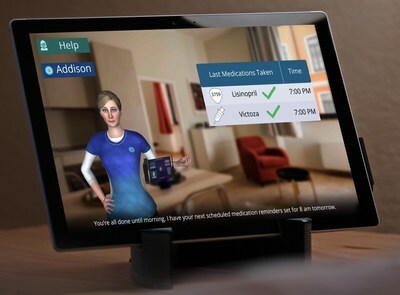 Meet Addison, a Virtual Caregiver with an interactive speech platform, full-3D body, a broad range of expressions and gestures, a pleasing and sometimes humorous personality, and a mind that grows in intelligence and becomes more capable as the weeks pass. Addison also comes with a wireless connected tool box she brings to the home in order to collect vitals, report emergencies or indications of health decline, the ability to assess details such as sudden increase in fall risk. She's been trained on your personal plan of care to help with verbal examinations, activity, rehabilitation and medication management. "The technology industry and many experts have said it simply couldn't be done. Not only have they said a comprehensive Virtual Caregiver was impossible today or in the near future, but they also stated there was no way to provide it affordably to customers, and that the investment to create it when technology became available, would require hundreds of millions, and maybe more," Anthony Dohrmann, CEO of SameDay Security, Inc., said. After nearly a decade of clinical research, screening thousands of patients, and working with leading technology companies, Dohrmann proved them wrong at CES 2019. Bryan Chasko, CTO of SameDay Security, Inc, developed and led the team that helped create and design Dohrmann's vision. "A virtual caregiver requires years of research, coordinating a lot of moving parts, and integrating the right partners and services," Chasko said. "We've aligned ourselves with the right investors and partners over the years and created a fantastic culture and internal brain trust. We also not only revealed a Virtual Caregiver concept, but we allowed executives from the largest retailers, technology companies, insurers and health providers take Addison for a spin. We collected real-time data, demonstrated vitals monitoring and provided real conversations with Addison. In addition, we gave fall risk assessments using Artificial Intelligence-based visual sensing, revealed numerous ways to access a physician or emergency response services and, ultimately, debuted Addison Generation 5 in 2019. Generation 5 wasn't expected until 2022." With 145 million Americans living with a chronic illness, it's reported 67 percent of patients don't comply with their prescribed treatment plan. Non-adherence is reported by leading medical publications as the cause of 50 percent of treatment failures. According to Pharmacy Times, "The estimated annual cost of prescription drug-related morbidity and mortality resulting from nonoptimized medication therapy was $528.4 billion in 2016 US dollars with a low end of $495.3 billion and high end of $672.7 billion." Also, the authors estimated nonoptimized drug therapy results in about 275,689 deaths per year. This has huge implications and gives more credence to companies tackling medication issues in the United States. Addison Care is designed not only to engage patients to comply with prescribed medication plans, medical tests and rehabilitation activities, but to provide verification of compliance, patient progress or decline, and continual in-home checkups. Addison Care developers believe they can significantly reduce the cost of long-term chronic disease management and long-term care for patient adopters, by up to 92 percent by 2050. The Company is currently engaged in in-depth clinical research programs with G60 Trauma, which specializes in trauma care and improving outcomes for patients age 60 and above. The Company is also focused on reducing the cost of home care for consumers and family caregivers, by providing an affordable solution with unprecedented care capabilities. According to Genworth Financial, national average costs for long-term care in the United States are currently $225 a day, or $6,844 per month, for a semi-private room in a nursing home, $253 a day, or $7,698 per month, for a private room in a nursing home, $119 a day or $3,628 per month for care in an assisted living facility (for a one-bedroom unit), $20.50 an hour for a health aide, $20 an hour for homemaker services, $68 per day for services in an adult day health care center. The cost of long-term care depends on the type and duration of care you need, the provider you use, and where you live. Costs can be affected by certain factors such as time of day. Home health and home care services, provided in two- to four-hour blocks of time referred to as "visits," are generally more expensive in the evening, on weekends and on holidays. Extra charges can be incurred for services provided beyond the basic room, food and housekeeping charges at facilities, although some may have "all inclusive" fees. Variable rates in some community programs, such as adult day service, are provided at a per-day rate, but can be more based on extra events and activities. Addison Care provides 24/7 care, vitals monitoring, real-time fall assessments, medication management, rehabilitation support, and 24/7 emergency response for just $13.30 a day, or $.56 cents an hour. This is the first time comprehensive home care has been offered at this price, using intelligent technology. Addison Care (www.addison.care) and associated Electronic Caregiver products (www.electroniccaregiver.com) are offered through leading home care providers nationwide.